Rehydrated Couscous (29%) (Durum Wheat Semolina),Water, Chickpeas (Sulphites) (13%), Sugar, Yellow Pepper, Raisins (4%), Rapeseed Oil, Apricots (Sulphites) (3%), Cranberries (2%), Red Wine Vinegar, Parsley, Salt, Lemon Juice, Honey, Coriander, Tomato Puree, Turmeric Powder, Black Pepper, Rice Flour, Roasted Garlic Puree, Ginger Puree, Red Chilli, Cornflour, Smoked Paprika, Sunflower Oil, Cinnamon Powder, Mustard Seed, Cumin Powder, Cardamom, Preservative: Sulphur Dioxide; Ginger Powder, Clove Powder, Nutmeg, Coriander Powder, Stabiliser: Pectin. 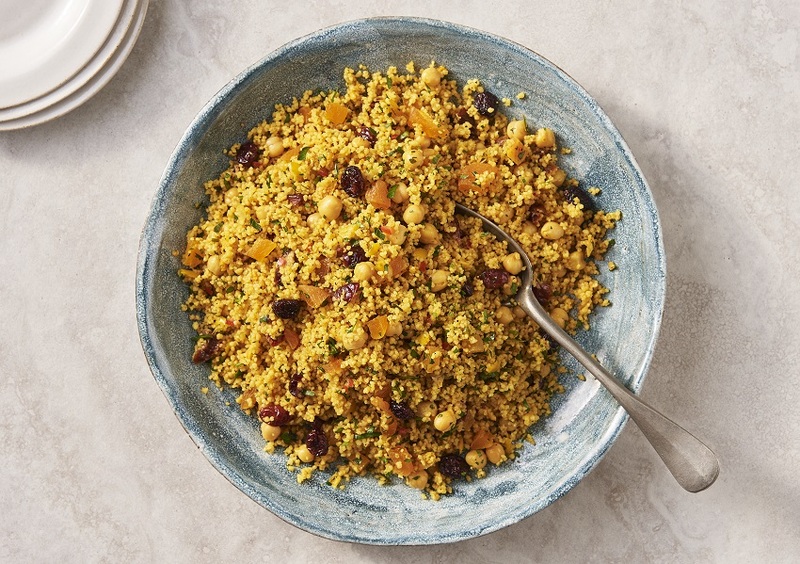 Rehydrated couscous with chickpeas and dried fruit in a spiced dressing. Although every care has been taken to remove all apricot stones, some may remain.